Though, PCs are not the thing of the past, who would have thought that the world would be shifting from the desktop computers to laptops over a period of time. Now after Apple has introduced what we say to be its trump card, the iPads, we can see the fan base moving towards the latter (especially after the launch of iPad Pro). With the performance speeds bettering up even than the best of the laptops, will the Apple iPads replace the laptops going forward? We agree that matching up the iPads and laptops isn’t an apple to apple comparison; however, one should agree that iPads are almost synonymous with tablets, given the huge share of iPads in the world of tablets. Had you asked us earlier, if the iPads can replace the laptops ever, we would have been a little sceptical in answering that, however, now after the release of iPad Pro, the answer is a well-earned ‘yes’. We will give you the advantages of an iPad over the laptops, leaving you the choice to decide which would be your cup of tea. 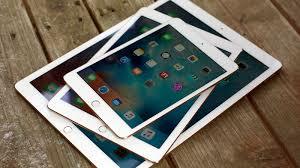 Portability: Portability is never an issue with the iPads, let’s agree to that. Even the largest of the iPads, the iPad Pro 12.9 weighs just 1.57 pounds which is lighter than any of the laptops available. Moreover, most of the iPads can fit into a large sized hand bag making it a worthwhile option on the go. Performance: iPads are slowly catching up with the Laptops where the multi-tasking capabilities or the processing speeds is concerned, especially with the iPad Pro, with which the Apple claims that the iPad Pro is faster than the fastest of the Laptops. Friendly interface: Even an amateur can work his way out with the iPad to perform the daily tasks like checking the email, or toggling between the apps. Battery life: Here the iPads score far higher than the regular laptops given the smaller display screens, the iPads’ battery generally last longer up to 10 hrs on an average. Games, music and Fun: iPads are fun to the core as the music and gaming apps are much cheaper on the iPad as compared to its counterparts opening up a large scope for gaming and music on the iPads. With a plethora of advantages of the iPads, it goes without saying that iPad lease is a better option if you are looking for a bulk use or an indefinite arrangement especially for businesses, events or meetings etc. VRS Computers offers the whole wagon of iPads for Rent giving our customers a variety of options to choose from right from Apple ipad to iPad Pro for long term to a short-term use. Contact us today for more details on iPads Lease in Dubai at +971 55 5182748 or you can email us at [email protected]vrscomputers.com.